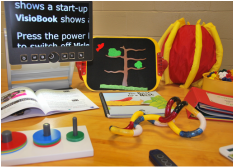 The “Focus on Vision and Vision Loss” website is a resource of the MCB/DDS Partnership Project for Orientation & Mobility/Low Vision Services, a cooperative effort between the Massachusetts Commission for the Blind (MCB) and the Massachusetts Department of Developmental Services (DDS). Partnered since January of 2000, our common goals are to promote healthy vision for all individuals with intellectual disability, raise awareness of needs for those with vision loss, and provide services, resources, training materials and events to help. MCB and DDS work with not-for-profit organizations creating meaningful collaborations to address the unique needs of individuals. There is a broad scope of vision loss related needs and challenges faced by people with intellectual disability. Support is needed for individuals who have total blindness, legal blindness, combined vision and hearing loss/deafblindness, vision impairment, low vision or who have vision perception challenges such as experienced from cortical vision impairment (CVI). In addition, a person may need support who wears prescription eye glasses and/or sun glasses, is scheduled for eye surgery, has a question of vision loss, and/or is looking for an eye care provider. The services and resources collaboratively offered through the MCB/DDS Partnership Project work to address individual needs. For more information on terms that decribe vision loss please see Vision Loss Terminology. MCB and DDS collaborate with and provide funding to private not-for-profit organizations for administrative support and specialized service by Certified Orientation & Mobility Specialists (COMS), and Vision Rehabilitation Assistants (VRA). Current partners include the Carroll Center for the Blind, the Education Collaborative for Greater Boston, MAB Community Services, and Shriver Clinical Services Corporation. Services are offered to adults eligible for service by DDS, or transitioning into DDS adult services. New England College of Optometry, New England Eye, DDS, and Shriver Clinical Services Corporation collaborative for this specialty vision clinic in East Bridgewater, Massachusetts to provide comprehensive eye care for individuals with intellectual disability. The clinic also serves to educate the next generation of eye care providers to best work with adults and children who have intellectual disability. Held by MCB and jointly administered together with DDS, eligible adults are able to receive free vision loss accessible materials through the APH Products Catalog. Eye care providers from across Massachusetts who have expertise in treating individuals with intellectual disability and who have given permission for practice information to be posted and shared are listed. The DDS Eye Care Provider resource is for informational purposes only and does not in any way constitute an endorsement or recommendation from the Massachusetts Department of Developmental Services (DDS). Funded by Shriver Clinical Services Corporation, this site offers resources and information for individuals, family members, caregivers, and staff. The site is linked to both the DDS vision loss website: www.mass.gov/dds/visionloss and to the MCB website. Downloadable and printable sheets developed by COMS working with the MCB/DDS Partnership Project to provide information and training resources on topics relating to vision, vision loss and skills/resources to help. The resource handouts are available in pdf and rich text formats and are also imbedded throughout this site where applicable. 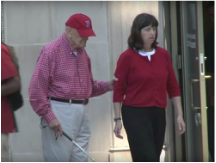 Produced in 2013, Emerson College, the Carroll Center for the Blind, Shriver Clinical Services Corporation, DDS and MCB partnered to create the video demonstrating use of the Human Guide technique (also known as Sighted Guide) by adults who have intellectual disability and vision loss. Taking place in Norwood, Massachusetts in March of each year, this day-long collaborative event is now in its 11th year. The multi-tracked educational program reaches out to the needs of individuals, clinicians, family members, support staff at day and residential programs, nurses, eye care providers, administrators, advocates and all concerned with the vision and vision loss needs of adults with intellectual disability. In addition, many resources are shared at the exhibit area and through poster presentations. The “Focus” Conference is organized by DDS and MCB together with Perkins, Boston University School of Medicine, New England College of Optometry, and Shriver Clinical Services Corporation. Additional sponsors provide funding support for the event each year. Taking place in the Franklin/Hampshire area of Massachusetts in late spring of each year, this half-day collaborative event, now in its 4th year, brings together a variety of professionals serving individuals across the DDS system. The Vision Symposium is organized by DDS, together with MCB. Quarterly lectures are offered on topics and resources that are of interest to adults with vision loss as well as family members and staff.